What do David Bowie, witches, chairs and fears have to do with a show about a couple planning a dinner party? 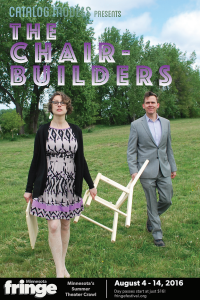 Catalog Models (Mark Sweeney and Gemma Irish) dive into how these elements found their way into ‘Invitation’, the opening number to The Chair-builders their 2016 Minnesota Fringe Festival offering. After about seven minutes of yammering and a peek into early versions of the song, you’ll hear Megan Kelly Hubbell sing ‘Invitation’. Huge thanks to David Orlicz for providing reeds in an alternate take of the song.